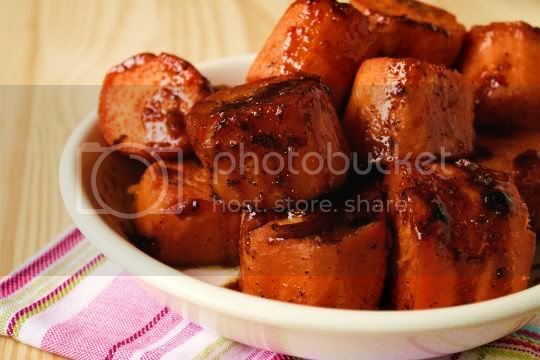 A great, simple side dish using the traditional holiday sweet potato, this recipe exposes a more savory and spicy twist to the vegetable. This isn't your usual candied sweet potato: instead, this is salty and spicy, with a wonderful burnt caramel flavor for the sweetness. The dish is very easy to make, with just a bit of vegetable prep, boiling, seasoning, and baking. The recipe suggests slicing the sweet potatoes into 1 1/2-inch "slices," but come on, anything that thick is clearly a chunk. For about 3 pounds of sweet potatoes, I used three long and large ones and ended up with about 20 chunks. Boil these for just 5 minutes, then arrange in a baking dish (I used 9x13), and sprinkle with salt, pepper, mini butter cubes, maple syrup, and water. The amount of liquid in the dish may seem unnecessary, but just you wait. 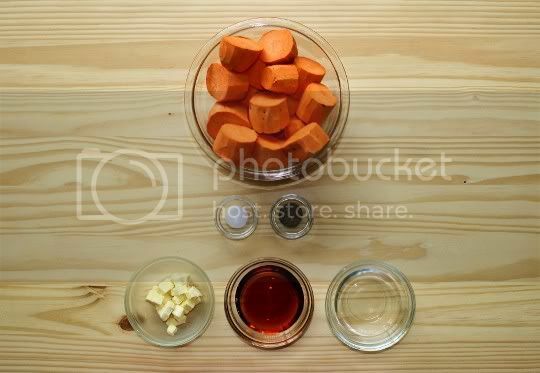 Toss the sweet potatoes in the dish until all the pieces are well coated, then bake. After about 15 minutes, turn the pieces over and baste them with the liquid in the dish. And after about 20 more minutes (or when your kitchen starts filling with the aroma of burnt sugar), check on them, toss them some more, broil if you'd like, and you're done! What was originally a thin, soupy syrup-water mixture is now a thick, salty-sweet glaze that beautifully coats the sweet potatoes. 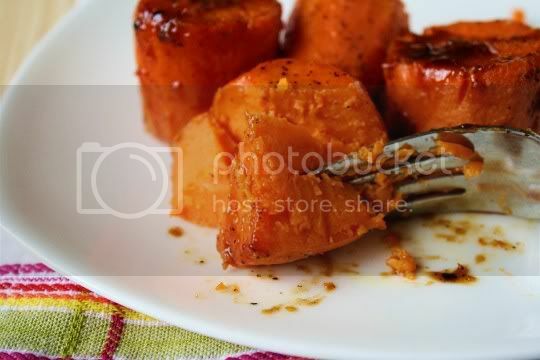 It's like a syrupy, roasted burnt sugar sauce that ends up caramelizing the potatoes, and you'll definitely want to use that extra sauce to drizzle over them for serving. On the other end of the flavor spectrum, the black pepper in the dish--an amount that probably seemed like a lot to add--gives a spicy kick that's pretty unexpected. You get a surprising amount of heat, yet the dish is perfectly seasoned with the wonderful combination of sweet and savory. And just look at those colors: deep orange shining through a rich mahogany flecked with black. A beautiful and appetizing dish for your holiday table! Make again? Yes, although I'd try slicing the potatoes into actual slices (not chunks), or maybe cubes. Vegan variation: Use vegan butter.